Tivon Rivers hasn't added a story. The TeslaGen v1 mini QEG is an adaptation of one of Nikola Tesla’s many patented electrical generator / dynamo / alternator designs. The particular patent referenced is No. 511,916, titled simply “Electric Generator”, and dated January 2, 1894. The adaptation is a conversion from a linear generating system with a reciprocating rod whose period is electrically regulated, to a rotary generating system. The reciprocating rod is replaced by a rotor whose motion is also electrically regulated, by means of tuned parametric resonance (parametric oscillation). The original intent of the patent (electrical regulation of the period (frequency) of a repetitive mechanical motion) is further expanded through subsequent utilization and application of mechanical self‐resonance and radiant energy, in order to make the machine self‐sustaining. The TeslaGen v1 mini QEG is a smaller design than the original QEG, and can be used on its own or with the original QEG for easier and faster experimentation of this unique form of energy creation. It is a two phase, six-pole, dual resonant generator. It has a new separable stator to allow for easy winding and is capable of powering loads between 700w-900w (conservative). Driven by a DC motor, and powered by your water, solar or wind installation, the TeslaGen v1 is built to provide available electricity during outages or off grid. With further development, this generator has the potential to power itself. The construction is a simple, yet rugged combination of high strength plastic frame and support rods, and is made using widely available parts and fittings. 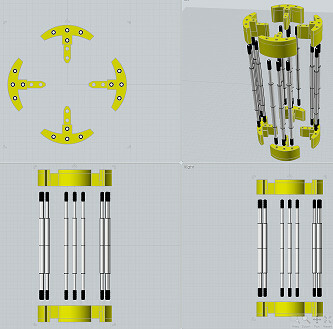 All parts of this reluctance generator is CNC manufactured, and the Computer Aided Design files for these parts will be made available online through this project. The length of the generator is 17 inches and approximately 7x7 inches wide. The rotor consists of a steel core and a stator. There are no magnets and no commutator. The construction consists of rigid plastic and metal, but mostly plastic so it’s lighter. The endplates are made from polycarbonate, which is about 30 times stronger than acrylic. The support blocks making the frame of the device are nylon 66, which is also very rugged. It has a weighted pulley option to run testing with weights and gaining momentum over time. There are pillow block bearings, good for 6,000 rpm on the rotor that are mounted on the outboard. The main shaft is connected to the rotor on the inside by shaft coupling locking devices. Optional is to connect the rotor directly to the shaft and have the rotor balanced. In this design the lock coupling device allows you to swap between different rotor configurations with relative speed. The rotor and stator is made from .35mm laminations. The stator is comprised of 4 separate interlocking sectors, which, allows you to take out each section and slide a pre-wound bobbin onto each side, and these sections can then be put back together. This makes for easier winding. This construction is inspired through contributions from the QEG forums working with other engineers. This project is open source. The TeslaGen v1 is patent and license free. This is a project in co-development, which is a unique way of opening this up to allow other DIY engineers to build alongside us and openly share their experiments and findings with others in a global online community. We are doing this in this manner because it is a way for the people to literally take back their power, and to help others develop forgotten skills and learn about suppressed engineering technology. Without enthusiasts like you, this open source project simply would not be possible. The more the merrier. So lets do this! 1) Build the first prototype by raising funds through a campaign and from our sponsor. 2) Write an in depth builders manual with full step by step instructions, a list of suppliers, and schematics. 4) Create videos and updates to showcase the project development and keep everyone informed. The first three phases are already complete. We are in the Fabrication and Assembly phase, and this is where we need your help! Manufacturers use metal moulds and tooling to produce rotors and stators for all motors and generators worldwide. We need these molds produced for the TeslaGen v1 prototype. For the sake of costs, we have located a manufacture in Asia. The remaining parts of this reluctance generator is manufactured by a process called CNC. We have located a manufacturer that will not only produce the parts, but also assist in the assembly of the TeslaGen. Eighteen months of research and development has gone into this variable inductance generator. Materials, manufacturing techniques, cost analysis and customization has all been considered in its design. The TeslaGen was designed using Computer Aided Design or 'CAD' software. 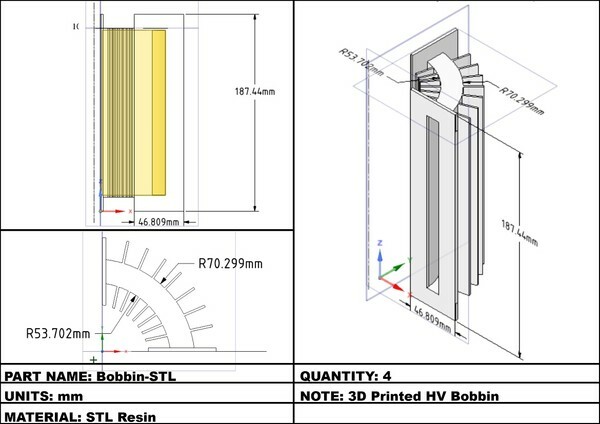 We have taken the time to save all the necessary parts to be machined in these CAD files. This means all parts to be manufactured for the generator will be made available for download from our website. With a donation of $100.00 DIY engineers can download these 3D CAD files which will enable a machinist or manufacturer to make these parts. As a special perk to help raise funds for the TeslaGenv1 mini QEG project, we are selling the CAD files for the parts to build the prototype. This CAD kit is a high quality professional CAD file package that includes everything you need to send to a manufacturer of your choice which will allow them to make your parts for you. As the project progresses over time, free updates to new CAD files will be made available to everyone who purchases these files from our Payloadz digital download product store. To get your instant download CAD file package for the TeslaGenv1 mini QEG, please visit the link here to purchase from our Payloadz store. You will receive an email with a download link to the files after you complete your purchase. We will manually add the gross amount of sales per CAD file to the campaign funds raised total to reflect the projects progress publicly. The bulk of funds raised will be applied towards the greater startup costs required to initiate a project of this nature. Tooling is a onetime expense needed to create the moulds that can then generate parts at a cheaper rate. Other equipment is listed to allow for a wide variety of research and development experimentation to increase the efficiency of this unique generator design and provide solutions and desired end results that can then be replicated in a shorter period of time. We estimate that after the initial project is launched, funded and research and development stages have been engaged, that this generator should cost an average DIY engineer between $1,500 and $1,700 to build. Tivon Rivers is the designer and developer of the TeslaGen v1 mini QEG project. He is a former Navy trained technician with 15 years experience in the electronics and IT industries. He is a clean energy technology enthusiast with a keen interest in new clean technologies that promise to clean our planet and end poverty. Tivons website Spacevisuals.com is a co-development project that explores technology to empower individuals, families and communities. The Quantum Energy Generator(QEG) project, is an open sourced (PATENT FREE!) potentially fuel-less generator prototype based on a public domain patented invention of Nikola Tesla. The type of energy that is utilized by the QEG design is different than that of a conventional generator. The QEG was opensourced in March of 2014 and has been in co-development with many teams around the world since this time. FOR A BEGINNERS GUIDE TO THE ORIGINAL QEG PROJECT PLEASE CLICK HERE FOR A SUMMARY OF LINKS. How much does the TeslaGen v1 cost to build? We estimate that after the first prototype is built that this generator should cost between $1,500-$1,700 USD for a DIY engineer to build. Due to the open source nature of this project, prices may vary. Are you selling TelsaGen v1 mini QEGs and where can I buy one? We are not selling TeslaGen v1 mini QEG’s. We are building prototypes and providing instructions to other DIY engineers. The TeslaGen v1 is not a finished product, rather it is an opensource project that is a state of co-development with teams around the world. If you are interested in obtaining a TelsaGen v1 for yourself, you can build one on your own, or have a skilled DIY engineer build one for you. How does the TeslaGen v1 work? Click here for a study that explains how reluctance generators work. Why are we doing a crowdfunding campaign if we have a sponsor? This project is being made possible by one of our good friends named Wilhelmina. She has agreed to sponsor this project to ensure that we make our funding goals to get this TeslaGen v1 built and out there available to the people. However, we still need further assistance from others to help us raise funds and awareness around this project. Doing this through a crowdfunding mechanism is an efficient way to allow others to participate and contribute to get involved, stay updated and help to co-creating something that can benefit all of humanity in the long run. This helps to ensure that we stay connected to the people and keep this project public and accessible. Also, more than one funder adds a grassroots foundational strength to ensure accountability and public reporting in a public and transparent manner. We have held several successful crowdfunding campaigns over the last three years, and have a proven track record of transparent financial reporting and updates on all project developments that we have crowdfunded. 6 Weeks of Live Blogtalk Radio Shows! To help keep everyone informed on the projects progress, we are going to hold 6 weeks of live blogtalk radio shows where Tivon and Hope will be discussing the many aspects of the project, its practical applications, discussing other topics in the free energy industry, and answering questions from callers and from a live moderated chat room. These radio shows will then be turned into youtube videos to help share this information with the public. Watch this space for updates on the shows. Our first show is scheduled for January 27, 2016. A link will be posted close to the date. We are asking for your help for the start-up costs through this campaign so that we can build something and then give away the plans to replicate it to hundreds of other engineers for free. This could help pass on the knowledge that can empower individuals to free themselves from the grip of the energy companies. The best part is, it can be used on its own, or in combination with the large QEG, wind, solar or other off grid combinations of your choosing. Please consider contributing to our Tesla Gen v1 prototype campaign today! Tivon Rivers hasn't posted any updates yet. Tivon Rivers is managing the funds for this campaign. The campaign is for a personal cause.